Questions and questioning are at the heart of rich math dialogue. We are in our first week of school and I realize that I need to work on my questioning skills to tap into the strengths of my diverse students. I have found a few resources to use to help me in preparing worthwhile questions. 1. At the Ontario Ministry of Education, there is an excellent article entitled, “Asking Effective Questions.” In the article there are eight tips for asking effective questions. But then there are many, many questions or question stems providing an amazing framework for asking good questions. 3. 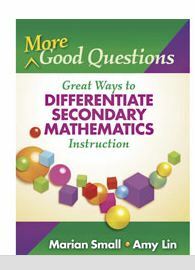 One other book I ran across provides ideas for differentiating. It is also organized in strands. 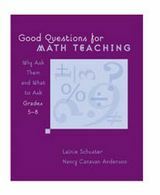 For each topic, the authors, Small and Lin, provide ideas for open questions and 2 parallel questions at different levels. One example that caught my eye is: “Another function is a lot like the given function. What might it be? Option 1: + 4. Option 2: . Follow up questions are provided: What happens to your function when x gets big? When x is quite small? What kinds of things might you change but still have a similar function? What would you choose not to change? I’m on the prowl for other great resources for developing strong questioning skills. Send me a note if you know of others! This entry was posted in Math at School and tagged math dialogue, questioning. Bookmark the permalink. 3 Responses to Questions and more questions! 1. Sometimes I start by giving the students the answer. That way when we’re talking about the process for finding the answer, they aren’t hung up wondering whether they’re correct or not. Also it demonstrates that I care about more than getting the right answer. 2. This may only apply to younger students, or perhaps students where English isn’t their first language, but I was surprised to find out how difficult it was for students to grasp “missing information” questions, the kind that end with, “What information is needed in order to…” It amazed me that until we had talked explicitly about this question type several times, my students (4th graders) completely ignored the part asking about missing information. They jumped right to the question that the missing information would help answer without grasping that it was not currently possible to find the answer. It goes to show how much understanding language is wrapped up in understanding math. 3. I like providing students situations with lots of information and asking them to pose questions. Not only does it help them connect with math concepts in a different way, but it also helps them see that you can ask a lot of questions about one set of data or one situation. Sometimes students come up with questions you wouldn’t even think to ask yourself. 4. Ask, “Are you sure?” even if they’re right! Students are pretty smart. They realize that adults often ask this question to indicate that the student has made a mistake. Why not ask it even if you know they’re correct? If you want a student to be confident in their answer, this is a question they should learn to ask themselves.